← South of Kings Cross is for independent Coffee! Yesterday’s murder at Pentonville comes as little surprise given the substantial rise in violence at the troubled local prison over recent years. 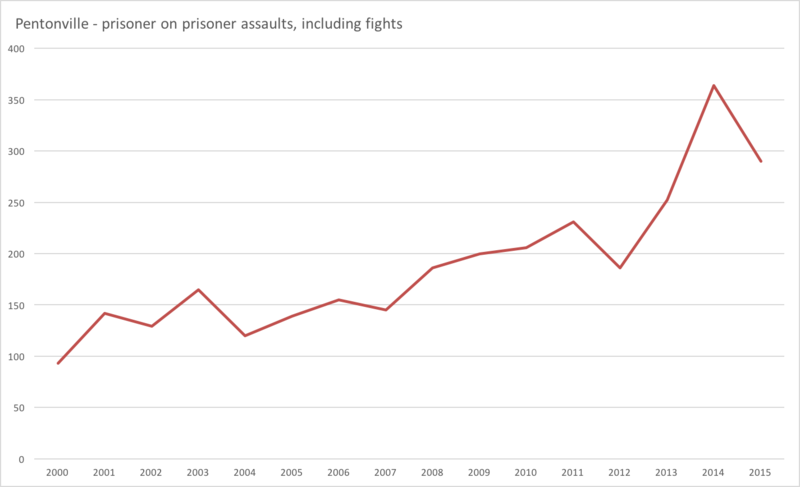 Government data shows a sharp rise in serious prisoner on prisoner assaults from less than one a month to one every ten days. Recent years have seen alarming trends in prisoner on prisoner assaults in general at the ‘Ville, at over one a day in 2014 now down a little to just under one a day. The reports go on and on (assembled into a single folder here). The prison has had profound management and startling allegations of staff corruption problems over the years. The prison system as a whole is suffering terribly as several forces come to bear. There aren’t enough prison places, there isn’t enough money, the estate is too old, the courts keep sending people to prison (instead of using non-custodial sentences in sufficient volume to reduce the population) and ‘legal highs’ appear to be causing problems. Lord Carter recommended building new super prisons – there were well intentioned custodial reasons for turning these down, but Carter had sufficient experience/cyncicism to see that no other solution would arise and his were the lesser of two evils. The time has surely come to close Pentonville (as local Councillors have been saying since 2010) and build a new facility appropriate for the modern age. Perhaps the Mayor and Islington Council can catalyse things by putting forward a development outline for the site. This entry was posted in Anti Social Behaviour and tagged #pentonville, pentonville prison. Bookmark the permalink. As with so many disasters, all this goes back to Grayling, the most inept, pig-headed and disastrous government minister ever. As Minister of Justice he could have done a lot to improve the prisons. I have been to several London prisons, admittedly only accompanying solicitors or police officers in the interview rooms (I am an interpreter) and even remand prisoners are made to live in disgusting conditions. I have also visited prisons in the same capacity in the USA, where conditions (at least in California) are a thousand times better. Sadly reform of the prison and probation system depends entirely upon who is justice secretary and nothing else. the arguments and data have all been out there for decades. clarke was promising but wasn’t around long enough. not sure where Truss will be – MOJ has brexit fish to fry right now. A planning brief for the site has been in preparation for several months. This followed the signals from previous Justice Secretary that the Govt might sell the site (to generate large capital receipt on the land sale). They seemed recently to cool on the idea. But the case for closing Pentonville should be a prison reform issue not a land transaction.